In order to define the clinical outcomes of a laparascopic approach to bladder reconstruction, we compared prospectively, our initial experience in laparoscopic augmentation cystoplasty with continent catheterizable ileal stoma to a similar cohort of patients who underwent an open approach. Eighteen consecutive cases of augmentation colocysto-plasty with continent catheterizable ileal stoma were performed at our Institute; nine patients underwent the open approach (eight women and one man; mean age, 45 years, range 21-56), and nine cases underwent the laparoscopic approach (eight women and one man; mean age, 36 years; range, 18-46). All cases were performed by the same surgical team. Indications for the operation were reduced bladder capacity and/or compliance either due to a neurologic condition (mostly multiple sclerosis), or idiopathic refractory detrusor overactivity. Before the operation, all patients had urodynamically proven detrusor overactivity with incontinence that had failed conservative therapy. The right colon and terminal ileum were used in the operation with the cecum and ascending colon being used to augment the bladder, while 10 cm of terminal ileum with a reinforced ileocecal valve was used to create the catheterizable conduit and stoma at the umbilicus. Demographic data and baseline characteristics were recorded for patients in both groups. Bladder and bowel function and the patient's perception of their symptoms and quality of life were assessed by asking the patient to complete the two questionnaires mentioned earlier. One year after the operation, changes in the patients' symptoms, their quality of life and their perception of treatment outcome were reassessed. Perioperative and convalescence parameters for each patient in both groups were recorded including operative time (defined as the time from skin incision to final dressing as recorded by the anesthesia team), estimated intraoperative blood loss, hospital stay, postoperative oral intake time, and the time to meet the discharge criteria (three consecutive meals without developing nausea or vomiting) (Table 2). 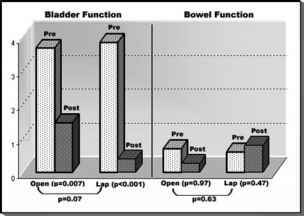 FIGURE 8 ■ Comparison between the bladder and bowel scale after open and laparoscopic approaches. discharge criteria (three consecutive meals without developing nausea, vomiting, or abdominal distension) was significantly shorter with laparoscopic approach (mean, 2.8 days) than with open approach (mean, 7.1 days, P < 0.0001). The mean hospital stay until the patient was discharged home was significantly shorter with laparoscopic cases (mean, 4.4 days; range, 3-6) than with open cases (average 8.2 days, range 5-11) (P < 0.001). There was significant improvement in the bladder function as demonstrated by the BLCS after both open and laparoscopic approaches. The mean improvement in bladder function after the laparoscopic approach and after the open approach was 3.8 and 2.2, respectively. Improvement in bladder function was better after the laparoscopic approach (P = 0.07); there was no adverse effect on the bowel function after both procedures (Fig. 8).